Mars & Earth come close every 26 months. Between July 27-31 Mars will be at its brightest in the night sky and it will be closest to Earth on early July 31. That is the point in Mars' orbit when it comes closest to Earth. Mars will be at a distance of 35.8 million miles (57.6 million kilometers). Mars reaches its highest point around midnight—about 35 degrees above the southern horizon, or one third of the distance between the horizon and overhead. Mars will be visible for much of the night. 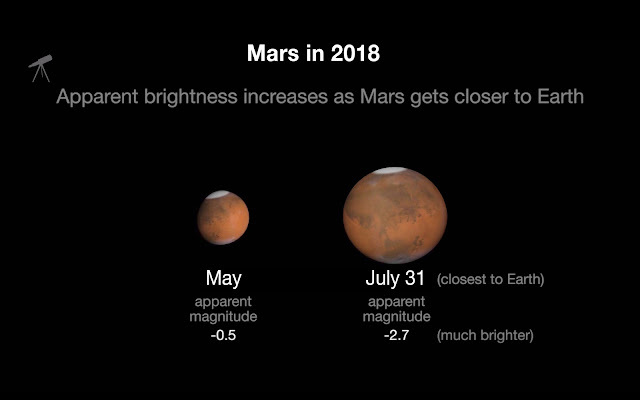 By mid-August, Mars will become fainter as Mars and Earth travel farther away from each other in their orbits around the Sun. Throw a star party, simply go outside and look up, contact your local planetarium, or look for a star party near you. What is Mars Close Approach? Close Approach is when Mars and Earth come nearest to each other in their orbits around the sun. Close is a relative term. The minimum distance from the Earth to Mars is about 33.9 million miles (54.6 million kilometers). However, that does not happen very often. If Earth and Mars had perfectly circular orbits, their minimum distance would always be the same. However, they have elliptical (egg-shaped) paths. In addition, gravitational tugging by planets constantly changes the shape of their orbits a little bit. Giant Jupiter especially influences the orbit of Mars. The orbits of Mars and Earth are also slightly tilted with respect to each other. All of these factors mean that not all close encounters are equal. In 2003, Mars made its closest approach to Earth in nearly 60,000 years! It won't be that close again until the year 2287. 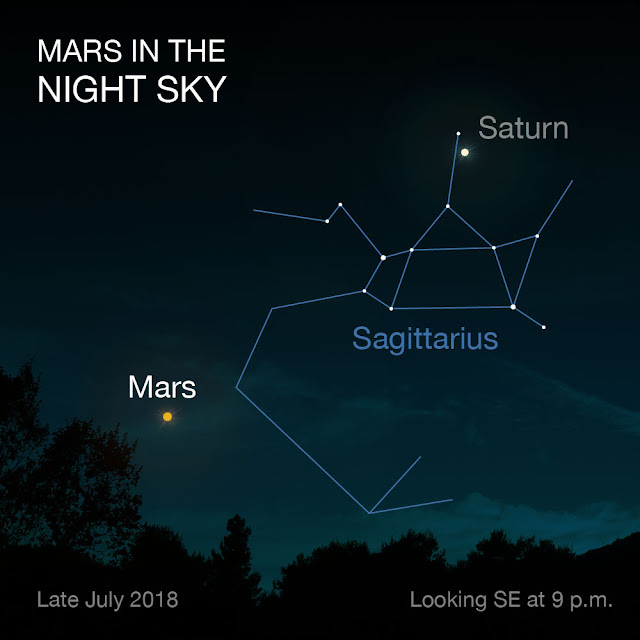 When Mars and Earth are close to each other, Mars appears very bright in our sky. It also makes it easier to see with telescopes or the naked eye. The Red Planet comes close enough for exceptional viewing only once or twice every 15 or 17 years. The next Mars close approach is October 6, 2020.